A native of Tennessee, Karen L. Robertson received a Bachelor of Music degree from the University of Tennessee/Knoxville, a Master of Music degree from the College-Conservatory at the University of Cincinnati, and a Doctor of Musical Arts degree at the Conservatory of Music, University of Missouri at Kansas City. 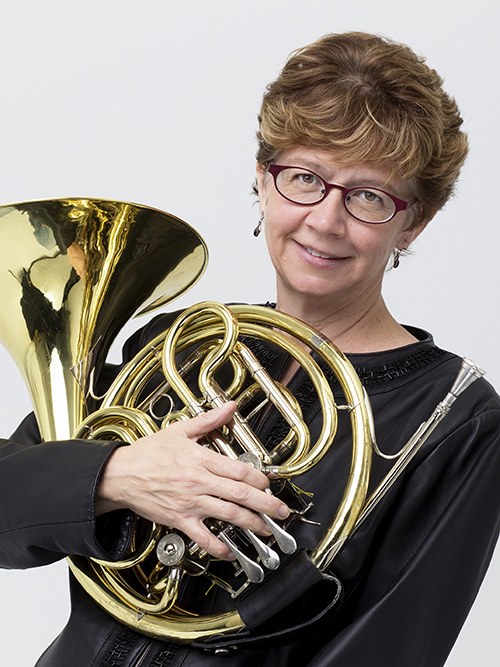 Dr. Robertson is Professor of Horn at Appalachian State University in Boone, NC, where she teaches Applied Horn, High Brass Methods, and coordinates the coaching for Brass Chamber Music. Before coming to Appalachian, she served on the faculties of the University of Missouri at Kansas City and William Jewell College in Liberty, Missouri. An active orchestral player, Dr. Robertson served as Principal Horn in both the Saint Joseph Symphony (Missouri) and the Kansas City Camerata from 1991-1995. She has also held prior positions with the Nashville Symphony (Tennessee), the Dayton Symphony (Ohio), the Knoxville Symphony (Tennessee). Since coming to Boone, she has performed with the North Carolina Symphony, the Greensboro Symphony (North Carolina), the Roanoke Symphony (Virginia), the Symphony of the Mountains (Tennessee), and the Western Piedmont Symphony (North Carolina). Dr. Robertson has won several awards for her solo performances, including winner of the 1993 Concerto-Aria competition at the Conservatory of Music, University of Missouri at Kansas City, and finalist in the 1994 American Horn Competition. She has premiered many works for horn, including a simultaneous internet broadcast/premiere of Sea Dreams for two horns and wind ensemble by David Maslanka, in 1996. Dr. Robertson was a Guest Artist at the 2006 International Horn Symposium in Tuscaloosa, Alabama, and is a frequent Regional Artist at the Southeast Horn Workshop. Dr. Robertson has performed solos with many orchestras in Missouri and in North Carolina; she has presented solos with both the Appalachian State Symphony Orchestra and the Appalachian State Wind Ensemble, performing as soloist with the Wind Ensemble at the North Carolina Music Educators Association's conferences in 1999 and 2007 and at the National Band Directors Association's conference in 2005. Brass chamber music coaching operates from the dynamic of learning to listen to each player within their group, a skill that will help each student perform better in ensembles, whether as a conductor or section player. Chamber groups are formed at the beginning of each year. The chamber ensembles are coached once a week, with at least two performances each year. Dr. Robertson's principal teachers include Nancy Cochran, Michael Hatfield and William Bommelje. These teachers, as well as work with artist/teachers such as John Cerminaro, Douglas Hill, Greg Hustis and Eric Ruske have greatly influenced Dr. Robertson's philosophy of teaching. Fundamental embouchure, sound and technical work is stressed, along with performance skills in both solo and ensemble areas. All students, whether performance, education or therapy majors, study orchestral excerpts. Every April, the Horn Studio at Applalachian presents "Cornocopia," a recital in which each student performs a solo; participation in this performance strengthens a hornist's ability to play under pressure; the resulting acquired skill will continue to help the student in every area of their chosen career.